Because of just how young they are, puppies are obviously experiencing the world around them for the very first time constantly! Things are new and fresh to them – just exactly what is going on? What is this? What is that? As a puppy, it is time to find out and learn! Considering just how crazy the appearance of snow can be, it is no wonder that puppies get super excited when they see that cold white stuff! 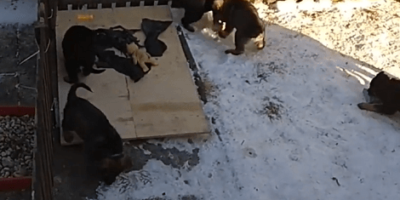 These German Shepherd puppies, however, have had some time to adjust to playing in the snow since the first snowfall. As a result, these puppies don’t seem to be too phased by the snow-covered grass in their playpen. Instead, they just drag their toys and run around on the snow-covered grass without giving it a second look. It is clear the cold still is affecting them, however – just look at how puffed up and fluffy their coats are against the cold! At least it isn’t hindering their playtime one bit!